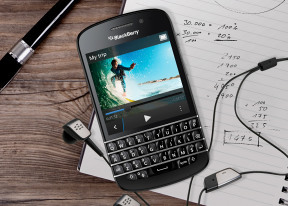 The BlackBerry Q10 comes with an 8MP main camera with an LED flash and a secondary 2MP camera. Both cameras can shoot HD video, 1080p for the main camera and 720p for the front-facing one. The interface looks pretty familiar at first - not too different than an Android camera - but much like the rest of the interface, the camera app has some handy tricks up its sleeve. The BlackBerry Q10 offers three shooting models - Stills, Video and Time shift, the mode toggle is in the top right corner. Below that is the Menu key, which offers several settings including a front/back camera switch, flash mode and aspect ratio (1:1, 4:3 or 16:9, there's no resolution setting). Also here are the Scene mode toggle (Auto, Action, Whiteboard, Night, Beach or Snow) and the Shooting mode toggle. The still camera can just snap pics, do digital image stabilization or enable burst shot. Burst shot photos are snapped at 6MP resolution. You get some more settings for the camera if you swipe down - pick a default storage and toggle geo-tagging. Photos are taken by just tapping the screen. You can use the volume rocker or the Space key as well, with a long press triggering the auto-focus before taking the shot. If burst shot is enabled, then the camera will snap pics in quick succession while you have your finger on the screen. There's also touch focus on board, though you have to drag the focus point to where you want the focus to be. It can take some getting used to if you're used to just tapping to move the focus point. Digital zoom is available too, it's activated through pinch zooming. The BlackBerry Q10 camera UI has two handy shortcuts. A thumbnail of the last photo you've taken is in the lower left corner and you can tap it to go to the gallery. Better still, you can swipe it to enlarge that photo for a quick view of how it turned out, and it will be minimized again when you lift your finger. The second shortcut appears in the upper left corner when flash mode is not set to auto. Tap the shortcut to get back to auto flash mode. The camera also has a feature called Time Shift - a technology we've first seen from Scalado. It snaps several photos in quick succession with just one tap at the screen and automatically selects the best one. It also detects faces in the photo (which can take several seconds, depending on how many faces there are). Once that's done, Time Shift allows you to tweak the photo - pick a different photo from the 11 that were captured and for each individual face that was detected, you also get to choose from 11 snaps. The BlackBerry Q10 uses an 8MP camera and we already knew what to expect from our encounter with the Z10, and we got exactly the same. There is plenty of fine detail, rivaling the likes of the iPhone 5 and Galaxy S III. Photos have low amounts of noise, with most of it in the form of monochromatic grain in the sky. Exposure and contrast are good, though the phone does slightly underexpose shadows. In backlit shots, we frequently got purple halos on the photos. Once again colors are oversaturated quite seriously. We know consumer cameras typically boost the colors to make images appear livelier but BlackBerry went too far here and we suspect the oversaturation is at least partly responsible for the noise. We wish BlackBerry put finer image controls in the camera interface, so you can go for more natural colors if you want. Still, it's a very good camera, one of the best 8MP shooters right now. Given BlackBerry's record with still cameras, we would have been happy with anything that produces usable images, but the Q10, just like the Z10, came way better than that. Here is an HDR sample as well. The BlackBerry Q10 challenges the best 8MP shooters in town and you can head over to our Photo quality comparison tool to see how it did. Switching the camera to video mode doesn't affect the user interface, it just changes the options available from the Menu key. You can still enable digital image stabilization and pick from the preset scenes. During recording, you can move the focus point around (again by dragging, not tapping) and you can toggle the video light on and off. There's no way to capture photos during video recording though. The main camera can shoot 1080p or 720p videos (720p is picked by default), while the front-facing camera can do only 720p. 1080p videos are stored in MP4 files with 16Mbps total bitrate. The mono sound was a big letdown for us, but the good news is it uses 192Kbps bitrate and 48kHz sampling rate (that's a lot of bitrate for a single audio channel). In terms of image quality, video recording is on the level set by the still camera - the clips produced are smooth at a consistent 30fps and with plenty of fine detail. Colors are again oversaturated but there's no visible noise. Here's a sample video recorded with the BlackBerry Q10 that we uploaded to YouTube. You can also download this sample (0:10s, 20.5MB) that hasn't gone through YouTube compression. The 1080p video recording prowess of the BlackBerry Q10 puts it near the top. Here's a look at how it stacks up against some of the best.